It is our school policy that all children wear school uniform when attending school, representing the school, or when participating in a school-organised event outside normal school hours. – is designed with health and safety in mind. We ask all parents who send their children to our school to support the school uniform policy. We believe that parents have a duty and responsibility to send their children to school correctly dressed in the correct uniform, that it is clean and in good repair and they have all they need for their day. Many uniform items can be purchased from most department stores but the uniform containing the school logo can only be purchased using the new school uniform provider Stitch Design. The letter below provides instructions for parents. Good quality second hand uniform can also be purchased at our regular SVPA Uniform sales which are held in the school hall. 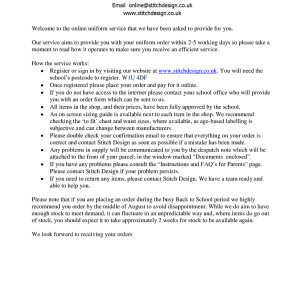 Please always refer to the uniform leaflet when ordering uniform.